KOE has announced the introduction of a new 14.9" widescreen TFT display module. The TX38D25VM0CAA features a resolution of 1280 x 242 pixels and IPS technology which enables wide viewing angles and provides a highly stable colour image with exceptional colour saturation and black levels. The 16:3 wide aspect ratio opens up the opportunity for new, niche applications where the display can be used in either landscape or portrait mode. Typical applications include digital signage, retail based point-of-decision displays, consumer information systems, AV mixing desks and industrial instrumentation. The 14.9" display module features an active display area of 372.48mm (w) x 70.42mm (h) and mechanical outline dimensions of 386.82mm (w) x 85.57mm (h) x 13.06mm (d). 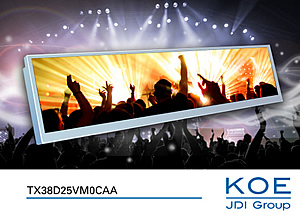 Mark Stephenson, Technical Marketing Manager, KOE Europe said, "The size and widescreen format of the TX38D25VM0CAA will provide the ideal display solution for a variety of applications where the use of LCD displays has been limited due to physical and mechanical constraints. The brightness, contrast and viewing angle performance of the display are not compromised in any way and remain exceptional due to the implementation of IPS." Excellent image performance is achieved with a contrast ratio of 800:1, a white LED backlight with a specified half brightness lifetime of 70K hours and a brightness of 450cd/m². The transmissive TFT features a single channel 20-pin LVDS data interface and supports 6-bit RGB providing a colour palette of up to 262K colours. The new 14.9" KOE TX38D25VM0CAA TFT display module is readily available.